Pre made pouch filling machine. Includes a four station rotary system for filling pouches and can accommodate a variety of different pouch sizes. 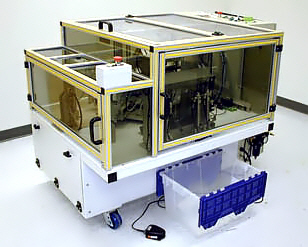 Options such as: label application, printing, gas flush, or vacuum snorkel. Special features such as pouch grippers to minimize wrinkling of sealing edges during heat seal. • Four station rotary table system. • Machine will fill various sizes of pouches. • Sealer will grip and heat seal pouch before pouch is released from vacuum cups to minimize disturbance of filled but unsealed pouches. • Heat sealer can be built in. Machine will fill foil bag and pouches, medical chevron, any bag or pouche that can stand up in a magazine.